PILOTA IS THE MOST ADVANCED MINE- HUNTERS COMMAND AND CONTROL SYSTEM IN SERVICE TODAY. IT HAS AS PRIMARY ROLE THE CONTROL AND COORDINATION OF ALL MINE SEARCH, IDENTIFICATION AND DISPOSAL TASKS ASSIGNED TO AN MCMV. PILOTA is supplied and installed as a turn-key system and it is interfaced with all concerned ship sensors and equipment so to constitute an integrated controller and supervisor of all ship mission functions. PILOTA includes a shore based Mine Warfare Data Centre (MWDC), system simulators and an optional Mine Warfare Training Range for complete mine warfare training and coordination. PILOTA unique integrated autopilot allows the combat room to be always aware of and in charge of all navigation aspects both for dynamic positioning and ship transfer tasks. PILOTA safeties, allow to avoid navigation in dangerous areas and guarantee suitable redundancies to cope for eventual failures. - Embedded autopilot (both for dynamic positioning and navigation) allowing the combat room to be always aware of ship navigation or position and providing guidance to the bridge as in case of navigation in minefields. - Own design, lightest in the market, non magnetic consoles made in carbon fibre. 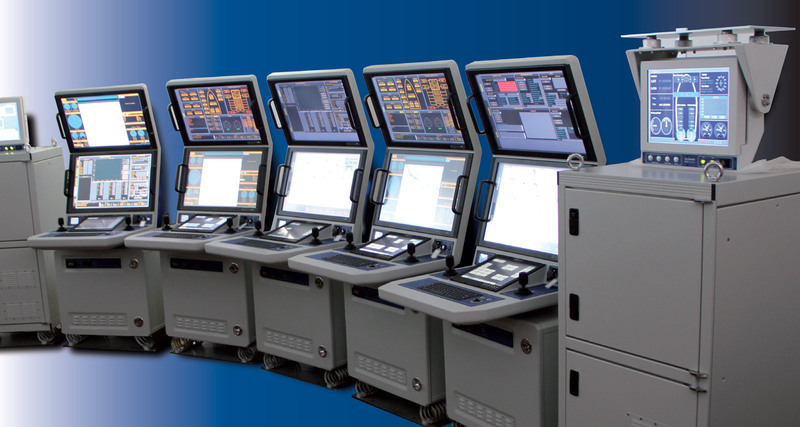 - Interchangeable Multifunction consoles to control different sensors or perform different tasks. - Complete optical isolation for Input and Output. - System’s Dual Input / Output shared over the LAN. - Digital, analog, serial, synchronic connectivity. - Unique console emergency mode allowing, in case of failures, to perform two tasks (one monitor each) from one console. - Navigation, bottom, dangerous areas and sonar deployment (depth and speed) safeties. - Embedded connectivity diagnostic table.